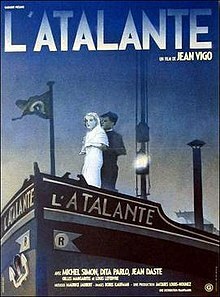 Jean Vigo's L'Atalante (1934) currently in revival at Film Forum is cinema’s ultimate love story in the same way that Un Chien Andalou (1929) is the archetype for filmic surrealism. And the two have something common. Both convey iconic dreams. In the case of L’Atalante the dream of a lost love, a floating image in water, is followed by a great deal of tossing and turning which may have created a romantic convention in and of itself. Above all the movie is an idyll and a fable. It begins with three shots: the eponymous barge, a church and ominous clouds. An ensuing shot of newlyweds is counterpoised by the premonition created when a bouquet is carelessly tossed overboard. It’s all very childlike, something between Le Petit Prince and one of those precious high school French texts filled with illustrations of the Luxembourg Gardens and pictures of your prototypic "garçon" and "fille." Phrases from your grammaire like “de bon heure” and “tu t’ennui?” pop out emblematically throughout the film. Boris Kaufman the younger brother of Dziga Vertov was on the camera. The music was provided by Maurice Jaubert and Michel Simon (who plays Le pere Jules) of Boudu Saved From Drowning fame are all part of the package. L'Atalante even exudes some Bovarysme when Juliette (Dita Parlo) is momentarily mesmerized by a Felliniesque performer and lights off to Paris. Many of the takes, amongst them one incredibly touching scene of Jean (Jean Daste) futilely running towards a vanishing point on the horizon of the sea, in search of his lost love, are paintings come to life.